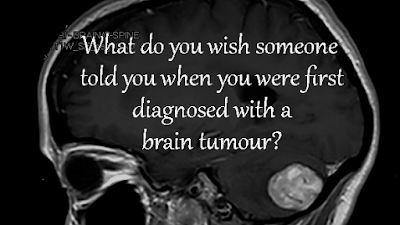 It's All In My Head: What do you wish someone told you when you were first diagnosed with a brain tumour? As like you, i wish i had been told a little more about the recovery. I had a giant menningioma on my front love removed June 2018, had a grand mal seizure 5 weeks later at home but had no choice but to go back to work 3 months after the op. Tbf im still struggling with good and bad days but I'm alive. I can live with the yearly MRI scans but the numb skull and dizziness is the hardest to deal with. Im glad you are going on well and with you the best. You mention cbd somewhere, how do you find it?